about music, culture and the art of the voice. Savina Yannatou has been one of the most consistently interesting Greek artists of the last few years. Her choice of material is always intriguing, her voice superb and her live performances always worth attending. Rootsworld's Nondas Kitsos spoke to her in early January about music, choice, voice and what it means to be a singer, Manos Hadjidakis' songs and the future. Her speaking voice is fascinating, with a rhythm that was almost musical. She would talk fast, then slow, laugh quite a bit, all elements that could be deciphered from her recordings. Yet, time and again, she would argue against a point made, express a strong opinion, start replying before the question was complete, always eager to move on. She would talk, search for the essence of the argument, then stop quickly when she felt like she had made her point. Reading between the lines, slowly, different aspects of Savina Yannatou come to life: her attention to detail, her prying ear, her careful choice of collaborators, her ability to visit an argument (and a song!) from many different angles, using both her unquestionable skills and her gut instincts. Yannatou began singing by accompanying her sister. Monserrat Figueras and Joan Baez both influenced her in her early steps, Figueras as a singer, Baez as the liberating 'woman with a guitar.' She had some classical singing lessons that left a lasting influence on her vocal style, but she steadfastly refuses to consider herself a classical or even operatic singer. She prefers to sing in a natural voice when the song allows it., but is open to mixing the techniques of both worlds when the material demands it. Her first steps in singing traditional songs came when the Greek composer Nikos Kypourgos approached her at the time of the birth of his daughter, in 1986, and asked her to perform some traditional lullabies that he would choose and orchestrate. The recording Lullabies was the successful result. "...for me that first encounter was really weird, it was not something I wanted to do, it was not really my sort of thing and I was really frightened about doing it but in the end it turned out to be something really nice that opened a new road for me. I saw another space through that, that I knew nothing about and I also saw how a traditional song could be sung, that is how I could adapt my voice to it and how a traditional song could be adapted to my mode of singing." In 1994, Xenophon Kokolis, a professor in the Thessaloniki University, commissioned her to sing a collection of Sephardic songs (songs in Spanish by the Jewish community of Thessaloniki) that was the result of an academic research project, to which she added four or five of her own. 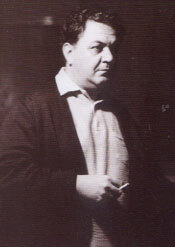 Kostas Vomvolos, a member of Primavera en Salonico, orchestrated the record and the ensemble has been her musical collaborators ever since. She chose the songs to appear on the record, based on their musicality, their relation to Thessaloniki and the need to offer a narrative of that community. This first effort resulted in a recording that bore the name of the ensemble, Springtime in Salonika. Next, on Mediterranea, a recording of songs from all over the Mediterannean Basin that followed, Savina Yannatou took a more prominent role, choosing the songs with the valuable help of friends and musicologists. It was the next logical step for her, taking the ideas she explored in Springtime in Salonika and using them on a much wider cultural canvas. Lambros Liavas, a well-known musicologist in Athens, researched the material for what was to become the next recording, Virgin Maries of the World, a collection of plainsongs, liturgical texts and laments about Virgin Mary. "Either way, those songs have been sung in many different ways by the Sephardic Jews themselves. There was a different way of singing them in France, a different one in Turkey, another one in Spain, another one in Israel... I mean, there is no way to know what is right and what is wrong, with those songs in particular. From a classic interpretation, meaning listening to a soprano singing, all the way to totally traditional or popular ones, with regards to where people have moved to, where they had immigrated to. And it's totally different from country to country, so it's very specific." Terra Nostra, her penultimate live record is a great introduction both to the de facto trilogy of Springtime in Salonika, Mediterranea and Virgin Maries of the World, as it contains songs from all three records as well as a few new ones. For her the "Our Land" of the title was not representative of some particular group. "I mean the Earth in general, everybody's! It's not 'ours,' my land, your land, but everybody's and it has songs from very different parts of the world or songs with the same melody and two or three different languages floating on it. That is the unifying element, not the differentiating one." Of music, voice, improvisation, technique and performing live. "I don't change their musical structure, I don't change the basic elements… I may add some improvisational elements towards the end, or it has more to do with the timbre of my voice that is not traditional, rather than the melody. I do not intervene in the basic form of the song." She respects the songs, because she would not improvise on every song, but only on those that allow for that sort of approach. "In a way it happens to songs that offer some leeway", she added. It's all a result of a certain personal intuition as well as in relationship to the performing group, who together choose the songs and where that flight of fancy might take them. When it was time for the inevitable "favorite sort of venue for a live concert" question, she replied that the important things for her are "the sound quality, how good the conditions are for the listener... not to lose his attention - that is the important thing." This relates to her belief that most people who came to her shows seem to have heard of her or they like what they listen to and stay, as is often the case in an international festival, where people rove around, looking for something interesting that will catch their attention. "Yes, it is cool and easy in the concerts you have attended, in connection to the group, but there has been a whole time process that has made things cool and easy. In other concerts, in other kinds of songs, it's not always that cool and easy. And I like that, I mean to feel that I'm mastering the sound of my voice that particular moment and that I do not have to consider the difficulties, but that I know where things are going, that is a very nice feeling. It's both the ease I had and lots of work, that, blood sweat and tears let's say. It's a training that's fun. It's like someone who works out, he doesn't stress about it. I guess that if somebody works out it's because he enjoys doing that." The human voice for her is "an instrument that resides inside our body. I mean you become an instrument yourself. That's a nice feeling. On the other hand the technique of singing is the same, for me, as playing an instrument. In a similar way as a musician leads his fingers, somebody leads his voice. I guess the same sort of thinking process takes place, the same emotions related to what someone plays, what sort of piece." The basic need she feels when singing is the effort to communicate, the effort to let all those feelings come across. Among the singers that have influenced her, she singled out Leonard Cohen, who "is not a singer but has that warmth in his voice and he speaks the words he sings about, and that is a very important element." 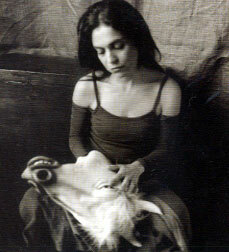 Another important influence was Diamanda Galas who lives in America and "has constructed this whole singing technique with strange sounds and she uses her voices in a very unorthodox way and I have been very much influenced by her, mostly in the improvisational part." Yannatou liked the fact that "she plays around with the scream and the narrative, the harshness, the sublime, all sorts of notions… I had seen her live in Athens and it was a breathtaking presence, she was very, very strong, very intense and that stayed with me. She presents something very concrete and very strong, that you just cannot ignore. Maybe something beyond logic, let's say, that communicates itself to our inner selves." She believes there are many great singers around today but they do not have the same sort of influence on her as the singers she listened to when she was young. She considers that "a bad thing, to tell you the truth. I can admire a voice very much, but there is not the same emotion I used to have, the same admiration – the same surprise." When asked about the influence being Greek has on her, she noted that it plays a great part, although she couldn't really articulate it other than saying that, "if I were English, I would certainly have had a completely different tone, a different timbre, another position in life, other studies there, because the way somebody is taught to sing in Greece is very particular. The kind of voices (Greek voices) I have listened to, the thing I do is a middle thing, it cannot be considered a national one but there is certainly an influence." "[…] something I had not thought about, so it is such a given for me what is happening, that it is recorded for posterity, I mean… It depends on how one sees things. I like it, regarding my own voice. I like the fact that it is recorded. And I have not thought about how it will exist when I no longer exist, I never thought about that, to tell you the truth. Once when I wanted to record a busker so I can have a record to listen to and built a music based on his, I did not do it in the end, because I did not want to imprison the moment. I wanted to let the thing I had listened to, that was related to a particular moment, when the sun rays fell a certain way, when I was sitting on a particular table… and to keep it in my mind like that and not to intervene in the moment anyhow. That is a different approach. Never to record anything, that is, ever, but just let things be. O well, we are always somewhere in the middle. I very often want to listen to what I have done and if I do not record it, I say, 'what a pity! I didn't record that!' (She laughs.) Yes, I generally like to record things. It's only under very special circumstances when I do not like to record things, because… there is no need for it, I mean, it's just nice for some things just to… be." For Yannatou, there is a big difference between singing live or recording in the studio. "They are two completely different procedures. They are both very, very interesting. In the studio one can be very precise, it's a very nice thing that you can search for every single note to be perfect, that you can record over and over again, that you cut and paste, all this is very interesting, while live it's the connection to the people that gives you something that recording in the studio can never give you. So, we have two completely different singing approaches and it's interesting that as little by little one gets to know that, one tries to unite them together. I mean to try to retain the correctness of the studio approach with the immediacy of the concert." Has she organized some techniques to make that happen? "Yes. It needs techniques! I cannot say I know them that well, but I'm slowly discovering them. It needs a lot of work, though, it's not self-evident." Her latest published work is a collection of songs by Manos Hadjidakis, a famous Greek composer. His most well-known work abroad is probably "Les enfants du Pirée" but he wrote many other songs and compositions in a career that spanned almost four decades. Savina Yannatou covers some of his best-known ones, among them songs from Reflections, a record produced in New York where Hadjidakis lived for a period of six years. It's a very direct record, combining sparse orchestration that accompanies her voice beautifully; it is more reflective, more settled than in her immediately previous records. On what can be considered a "Best of Hadjidakis' CD is a much needed introduction to one of the two most important Greek composers of the last fifty years (the other being the much better-known abroad Mikis Theodorakis). "Well, it was a weird choice because the company wanted to issue a live record that would contain songs by Hadjidakis as well as other composers and we finally decided to issue a record that would present a unity, not for it to be various songs but to be by one composer only and also that it would be much better if it were not to be recorded live but to be a live studio record in a way, with a new orchestration, very few instruments, but all the instruments were playing together and it was just my voices that were added later, on top… It was not some ponderous, grave decision, a very new thing, those are songs that I have already sung in the past; it's just a new approach. The thinking behind it was that I've been singing those songs all those years live but they were never recorded. Well, they had been recorded back in '82, when I had made a record with similar songs, but there are many years since then and so now, maybe, I could bring something new to them, of more substance perhaps." The fact that those songs have been covered many times in the past, by many different singers, did not lead her to seek a radically new approach, but rather a personal one, one that depended on the individual song. "My desire was not to produce something totally different to what exists up to now, to innovate... No. It was to express something personal. Just that." Right after Terra Nostra and the Hadjidakis song cycle, it's too early to tell what comes next. It will be decided together with Primavera en Salonico, as there are no fixed plans at the moment, just certain ideas that need some time to evolve. She likes working with Primavera en Salonico. "I think it is a group that needs to be kept for as long as possible because what I see is that it's getting better every year and so it would be a very great pity if it were for something like it to exist and then to be destroyed, I wouldn't want that in any way!" Yannatou is a little less specific about her collaboration with Lamia Bedioui (the Tunisian singer who collaborated with her on Mediterranea and Terra Nostra and who adds an Arabic overtone to some of the songs she performs). "I don't know… With Lamia Bedioui we have co-operated in the past, but it will depend on the new material. We'll see how, because the issue is not to repeat the same thing over and over. We are out together live, and this will continue this year, too. We'll do some more concerts together. As long as we are to keep on making new things, yes, of course. If this will stagnate, then we won't continue doing it. Things will tell…"
"Oh! I cannot discuss that, because if I haven't done something at all, then I push myself to do it! (laughs) So, if I had already something in the works, I would have said it: "Yes, I'm working on that thing", but, I need to get it started at the very least." Recordings by Savina Yannatou are released on the Lyra label in Greece unless otherwise noted, and are available from cdRoots.